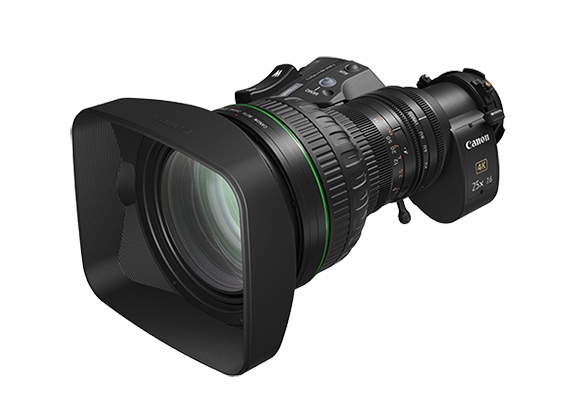 SINGAPORE, 12 September 2018 - Canon today announced the launch of two new field zoom lenses for broadcast cameras - the UHD-DIGISUPER 122, which realizes the world’s widest angle1, longest focal length1 and highest zoom ratio1; and the UHD-DIGISUPER 111, which delivers a long focal length and high zoom ratio that covers a wide range of shooting. The UHD-DIGISUPER 122 and UHD-DIGISUPER 111 combine excellent optical performance exceeding 4K2 with focal lengths covering a broad range, high zoom ratios and superlative operability. Realizing descriptive power with exceptional color reproduction from the wide end to the telephoto end, these lenses make possible realistic, high-resolution video shooting for sports broadcasting at large stadiums and for indoor events such as concerts. Canon’s flagship field zoom broadcast lens, the UHD-DIGISUPER 122 realizes the world’s widest angle1 and world’s longest focal length1 - 8.2mm at the wide end and 1000mm at the telephoto end, as well as the world’s highest zoom ratio1 of 122x while achieving high resolving power exceeding 4K. The UHD-DIGISUPER 111, with a 111x zoom ratio and a focal length range of 8.3mm to 925mm, also achieves an even higher zoom ratio than existing lenses such as the UHD-DIGISUPER 86 and UHD-DIGISUPER 903. 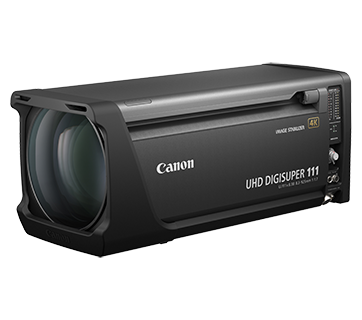 Designed with optimal lens placement and assembled with high precision parts, the UHD-DIGISUPER 122 and UHD-DIGISUPER 111 achieve exceptional optical performance exceeding 4K, delivering high-resolution, high-contrast video capture from the center to the peripheral areas of the imaging field. Both models are also the first broadcast lenses to employ Canon’s proprietary Air Sphere Coating (ASC4) technology, to achieve reduced flaring and ghosting, making both lenses ideal partners for increasingly common use of HDR5 and Wide Color Gamut video shooting. The UHD-DIGISUPER 122 will be available in May 2019 and UHD-DIGISUPER 111 will be available in March 2019. 1 Among field zoom lenses for 4K broadcast cameras employing 2/3-inch sensors. As of September 12, 2018, based on a Canon survey. 2 Performance that makes possible capture of sharp, high-resolution, high-contrast video with reduced occurrences of such aberrations as color bleeding and fringing while adequately supporting 4K (3840 x 2160 pixels) sensors. Achieved through the application of proprietary Canon technologies. 3 The UHD-DIGISUPER 86 (released in May 2016) features an 86x zoom ratio and a focal length range of 9.3mm to 800mm. The UHD-DIGISUPER 90 (released in February 2016) features a 90x zoom ratio and a focal length range of 9mm to 810mm. 4 Technology that creates a film containing microspheres of air, which achieves an ultra-low refractive index, over a vapor deposition lens coating. 5 High Dynamic Range refers to a technique that enhances the contrast between light and dark values (the dynamic range) of an image.